Winemaker’s Notes: A blend of Mourvedre, Syrah, & Grenache combine for seductive flavors cherry, raspberry and chocolate, with hints of cracked black pepper and plum. A versatile red, Cashmere is an outstanding choice with grilled salmon, pork roast, or duck. My Review: I’ve had a lot of GSM (Grenache, Syrah, Mourvedre) blends over the years. It’s a solid mix, and there’s a reason people keep making it. I don’t, however, believe I’ve ever had an MSG blend (Mourvedre, Syrah, Grenache). 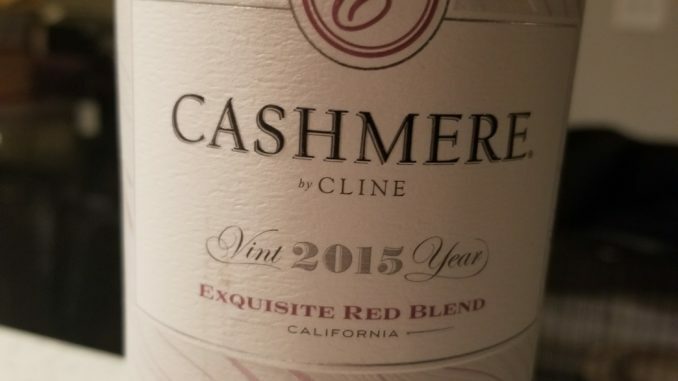 I may have been missing out, but fortunately, the 2015 Cashmere Red Blend from Cline has fixed this problem. In the glass the wine was a light garnet red, and on the nose I picked up red fruit and a hint of earth. In the mouth the wine showed red fruits with a dry finish that featured a hint of chocolate and a whiff of anise that quickly passed. My wife and I paired this wine with french dip sandwiches we had made, but I could see this pairing with richer seafood like salmon. We’re quickly closing in on the holidays, and if you’re looking for a versatile red to take to parties and share with friends, this is a good option at a good price. As a bonus, a portion of the proceeds from sales are donated to charity, so you can get wine and charitable giving all knocked out in one pass.